The Minnesota International NGO Network (MINN) is ringing in 2014 just a few days ahead of the Lunar New Year. 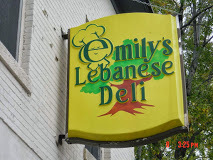 Join them at Emily's Lebanese Deli for a lunch gathering organized by the MINN Social Committee. Take this opportunity to celebrate what the new year has brought so far and/or prepare for what the Year of the Horse promises! Please join the MINN Social Committee as it coordinates the MINN New Year lunch Wednesday, January 29th at 12 pm at Emily's Lebanese Deli located at 641 University Ave NE, Minneapolis, MN 55413. This lunch is a popular, low stress opportunity to gobble up some yummy food and connect with peers. This event is open to both MINN members and non-members.